Kalamari or Calamari is the culinary name for squid and is very popular in Greece, as it is a delicacy found on the menu of almost all the Greek restaurants. However, at the restaurants, you usually get fried kalamari but why limit it to that when you can cook it yourselves, in so many other ways. We are very fortunate to live in a country surrounded by The Mediterranea and thus fish and seafood are very fresh, so it’s a pity to see people buying frozen kalamari, just because they don’t know how to clean them. If you can get fresh kalamari, which we usually do in Greece, you will have to learn how to clean it first, in order to cook it. Frozen kalamari are usually sold cleaned. You can then grill it, fry it coated in flour or battered, stuff the body with rice and herbs or you can make risottos, serve it with pasta, etc. Molluscs, such as kalamari, octopus, shrimps, etc, are allowed to be eaten during Lent, so these are very popular as an alternative to meat. 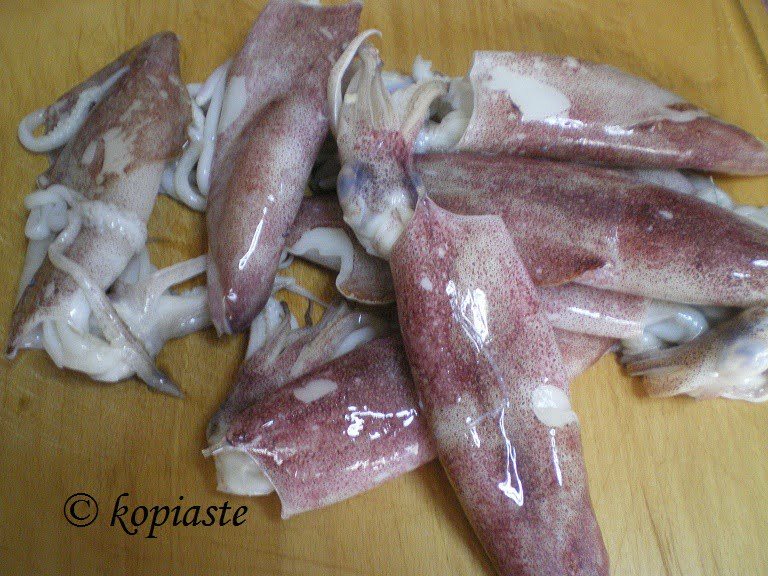 Fresh kalamari are too expensive for the Greeks, especially after the economic crisis, but thrapsala, (Illex coindetti or short-fin squid), which belong to the same family as kalamari but are much more cheaper, at least here in Greece, are equally delicious. To clean the kalamari, remove the part where the head and the tentacles are, by holding the tail and pulling the tentacles. Keep just the tentacles making sure not to break the ink sac and then remove the white small ball in between the tentacles, which is the mouth (jaw). The ink from the sac is also edible and considered to be a delicacy. Just a few drops in risottos, sauces or soups are enough to add flavour and colour to the food. Remove the cuttlebone from inside the body of the kalamari (squid). Remove the innards of the Kalamari sac and wash it well. The body of the kalamari has two fins. If you are going to stuff the kalamari, you can either leave them on or use them together with the tentacles in the filling. If you are going to fry them, remove the fins and skin and cut the body into round slices.